During the 1980s British American Football boom, Cardiff, Swansea and Newport all boasted adult senior teams but only the students of Cardiff University had formed a university team. The Cobras established themselves as one of the strongest teams in the fledgling British university league. While the South Wales Warriors remain the only senior team in Wales, students at Cardiff, Swansea, Aberystwyth and Bangor are all representing their colleges in the 76 team UK university championship. But nearly thirty years on from the Cardiff Cobras taking the field and reaching the first two College Bowl UK national finals their position as not only the dominant team in Wales, but also among the UK powerhouses, is challenged by the upstart Swansea Titans, who only suited up for the first time five years ago. The South Wales derby, between Cardiff City and Swansea City, is often cited as one of the most intense in British professional football. There is a natural rivalry between the Welsh capital and Swansea, often called the second city. A university American Football match will never match the off field passions of a Bluebirds/Swans clash, but a South Wales ‘Rivalry’ – as America terms its local dust ups – could be a welcome boost for the sport. On Sunday, December 7 both undefeated teams met at the Cardiff University Sports Fields in Llanrumney, with the winner in pole position before the Christmas break to claim the South West Conference title when fixtures re-start in January, 2015. While I’ve no connection to either institution, I first saw the Cobras play, at Pontcanna Fields in the late 1980s. ‘Britball’ is usually played in the summer, but I can remember, as a 10 or 11-year-old, spotting what looked like an American Football game taking place in a far corner of the flat park on an otherwise cold and dismal autumn Sunday afternoon. I dragged my brother and sister across the patchwork of deserted football (soccer) pitches until we were close enough to confirm the blur of moving red shapes I’d seen on the horizon was an actual game of (American) football. To this day I can’t remember anything about the opposition, not even the colour of their uniforms. 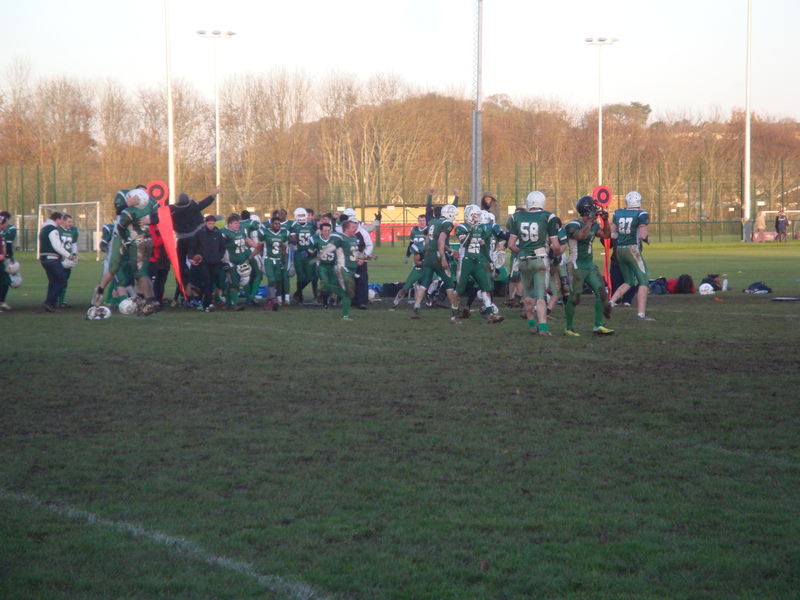 But from that first chance encounter with the previously unheard of Cobras, on public recreation ground at a time when senior teams would normally play in enclosed stadia, I cherished British collegiate American Football on winter Sunday afternoons. As life moves on and circumstances change I’d lost touch with the university game but heading for another wide expanse of playing fields, this time on the other side of Cardiff, on Sunday I found the game to be much the same as it was some 25 years ago. Student football, in which many of the players are genuine rookies having only taken up the sport during their first term in October, is usually pretty basic. Inexperience and the British weather combine for a run dominated game. A heavy shower shortly before kick-off meant even with as pleasant an afternoon you’re as ever likely to find in December the South Wales rivalry would be muddy underfoot. Swansea are the defending second tier National Challenge champions and went into the game undefeated throughout 2014 and having not conceded as much as a two point safety in their three games since the current season began in October. Cardiff have taken many teams by surprise, climbing to the top of the South West conference and a four and 0 undefeated record after two losing seasons. On Sunday, Cardiff and Swansea spent most of the first two quarters stuck between each others’ 20 yard lines – and literally ground down in the midfield mud. But in the final minute of the first half Titans QB Simon George pushed over to score from three yards out, and following a conversion the visitors took a seven nil advantage in at halftime. The game then sprung to life on the stroke of the fourth quarter as the Cobras took possession following a missed Swansea field goal. From nowhere Cardiff found a passing game to drive downfield. Then QB Rich Gardner rolled to his right looked up and found receiver Stefan Pollit on a fly route down the sideline for a thirty yard touchdown pass, with the extra point good the game was all tied at seven a piece. The Cobras were now looking for the go-ahead score but a costly fumble meant they couldn’t capitalise on what looked like another promising drive. The stalemate continued but with the clock ticking the Titans kept running downfield and with just 30 seconds to play running back Jacob Amadi swept right and sprinted 25 yards to score in the corner, with the extra point again converted. Cardiff had just seconds to try and force overtime. 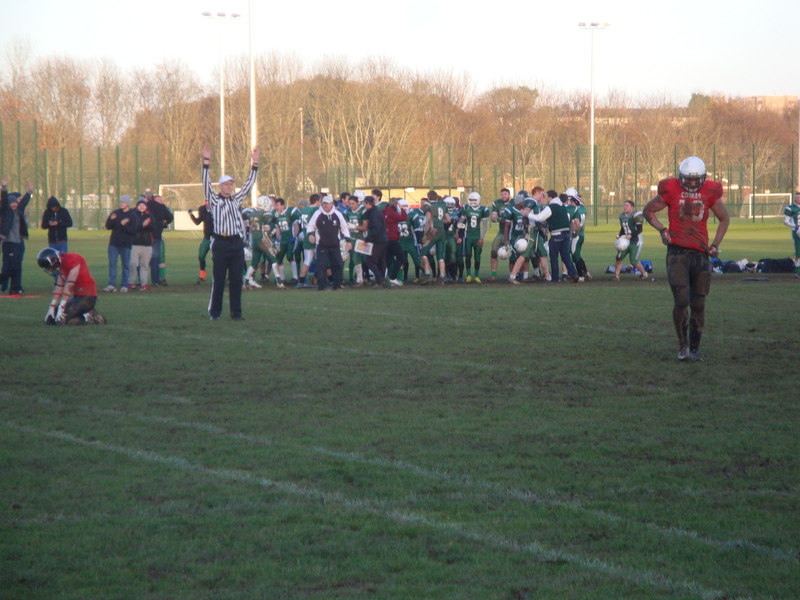 All hope was lost for the Cobras when QB Gardner was dumped to the ground and sacked, the ref’ took hold of the game ball and Swansea had won 14-7. 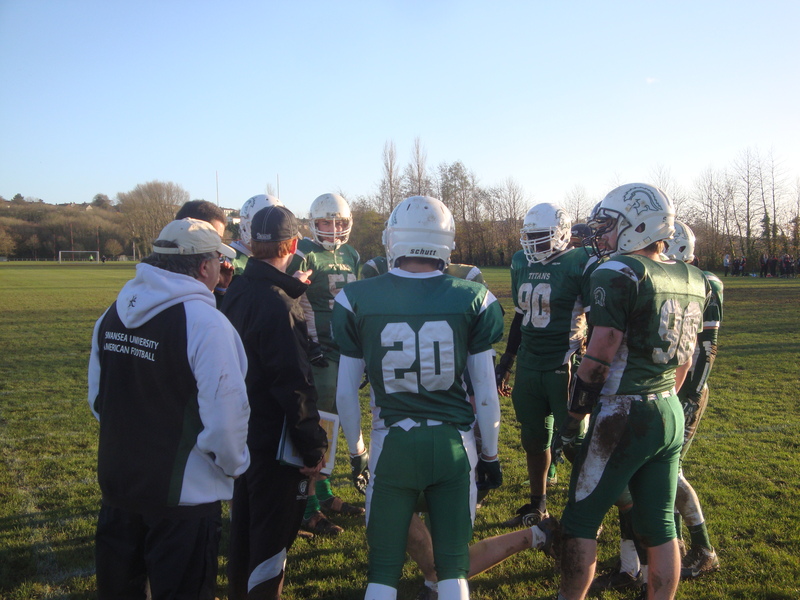 Some Cobras sank into the mud, only the conference champions progress to the play-offs though the talk among supporters was that Swansea will struggle against the two Bristol teams Cardiff have already put to the sword. There may be little in common between British and American collegiate football but anyone following the weekly announcements of the play-off selection committee in America would welcome the certainty of the conference winner takes all scenario facing Cardiff and Swansea, even if the stark reality of losing a crunch clash appeared too much for some Cardiff players. 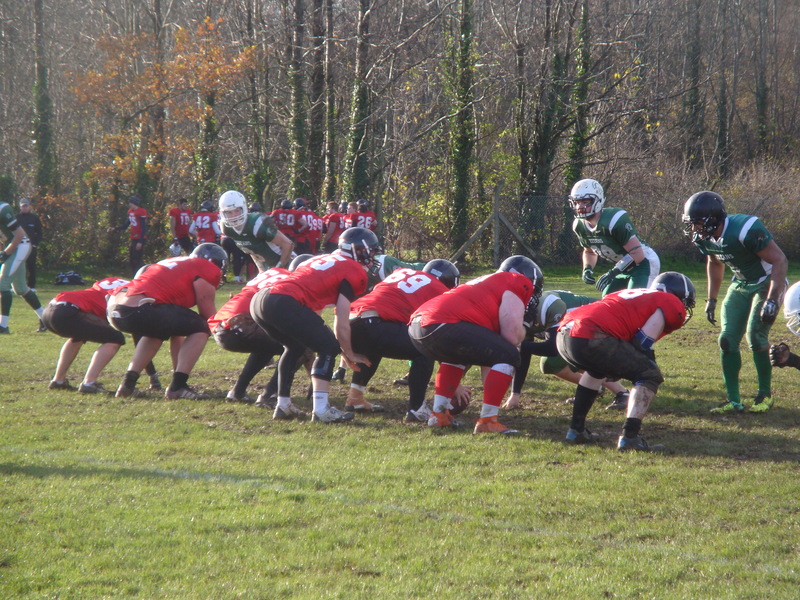 The new year fixtures will decide whether Sunday’s derby was the crucial game in deciding the conference but the Titans and Cobras will at least get a chance to fight for South Wales bragging rights once more when they clash in the end of season Varsity match and the university students write another chapter in the history of American Football in Wales. This entry was posted in Sports and tagged American Football, Britball, Cardiff, Cardiff Cobras, Cardiff University, College Football, South Wales, Swansea Titans. Bookmark the permalink. 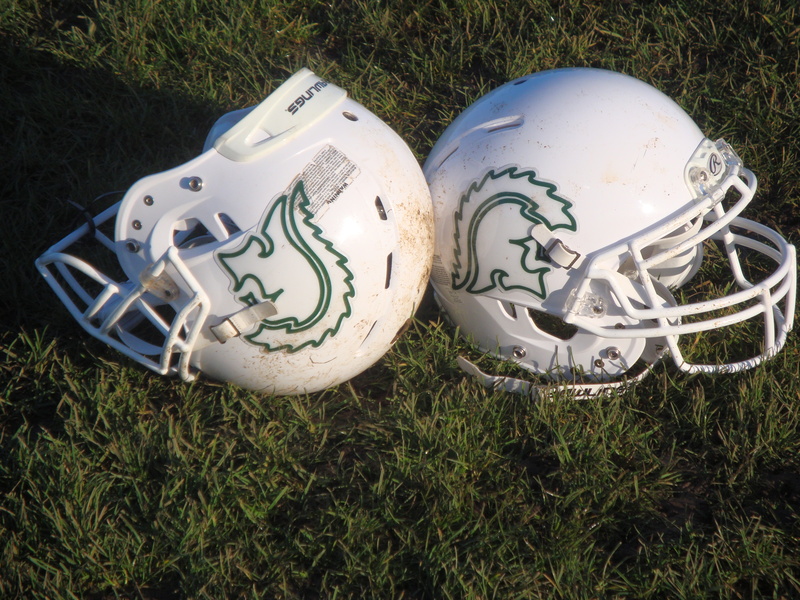 Great read about South Wales student American Football. Nice write up. We hope to see you on the sidelines for future matches. Thanks Jason, I hope to take in a few more games this season.